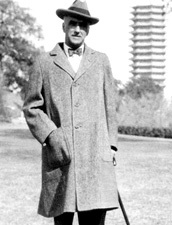 He is the founder and watchman of this university. 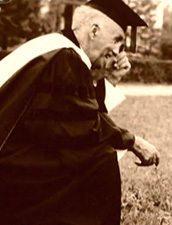 He is John Leighton Stuart, the first headmaster of Yenching University. In this cemetery in the suburbs of Hangzhou City, an American is buried. His name was known and honored by the Chinese people. However, washing away all the detritus of history, perhaps the way he wanted to be remembered most is just as is written on his tombstone: The First Headmaster of Yenching University John Leighton Stuart. Peking University at a hundred years old has a long history and a profound cultural background. It is also well-known for its scenic campus.It is beautiful here all the year round, providing a respite from the busy city. This adds somewhat to its quiet beauty. 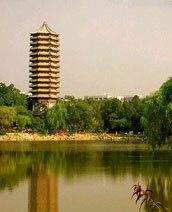 Although few peple realize it this campus used to belong to another university, named Yenching University. In the Garden of Swallows, there is a peaceful courtyard. At the beginning of the last century, which was beautifully named Linhu Pavilion by Bing Xin the Chinese writer. Many famous educators and celebrities visited this place. 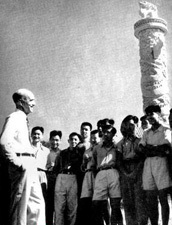 This was because they had a friend in common, John Leighton Stuart the host of Linhu Pavilion. Surely teacher and students are more familiar figures here.